20 June 2018: Updated to link to new page for the survey on BCG website. You can participate in a survey and provide your opinion on the Proposed DNA Standards through a Google Docs survey linked from https://bcgcertification.org/proposed-dna-standards-for-public-comment/. Please leave comments by 23 July 2018 explaining your agreement or disagreement with the proposed standards. Comments will be used to modify the standards as needed before acceptance and publication. What does this all mean? Standards are written formally and most of us understand informal language better. Breaking down each segment makes the meaning more clear. The first thing many researchers who share DNA do is compare pedigrees (family trees) or surname lists looking for a common ancestor (or an ancestral couple; the term common ancestor will be used for simplicity even when an ancestral couple may be the source of a DNA segment). The first common surname, person, or couple found is often assumed to be the source of the shared DNA segments. That assumption may be right or wrong. More evidence is needed to determine which is more likely. Genealogists must also consider that two test takers who share DNA may not have inherited all of that DNA from one common ancestral couple. If two test takers are related in more than one way (such as through pedigree collapse or endogamy) this can be difficult to determine except with thorough research and correlation of the DNA and documentary evidence. When analyzing pedigrees there are three critical concepts. Some common things to review when analyzing pedigrees are listed here. Accuracy of the pedigree: a pedigree either has the correct ancestors linked for each generation or it does not. If the pedigree of any DNA test-taker under analysis is inaccurate then the common ancestors may never be identified. 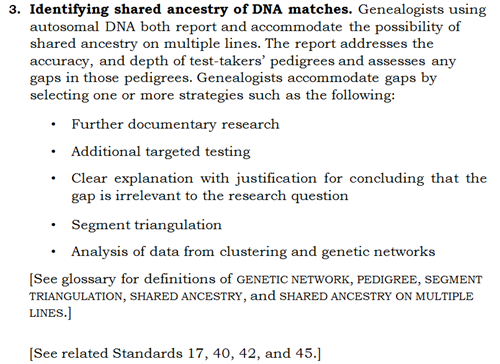 Accurate pedigrees are the result of research that meets the Genealogical Proof Standard (See "Useful References" below; the GPS summarized and paraphrased is): A focused research question, thorough research, correctly cited sources, thorough and competent analysis and correlation of all evidence that is pertinent to the question, resolution of any conflicting evidence, and a sound written conclusion). Researchers can analyze the accuracy of pedigrees by confirming the consistency of assertions (no children born when a parent would be too young, too old, deceased for more than nine months, in a different location at the time of conception, etc.) and that the most credible sources support each assertion. See “Accuracy” at the bottom left of the pedigree image. 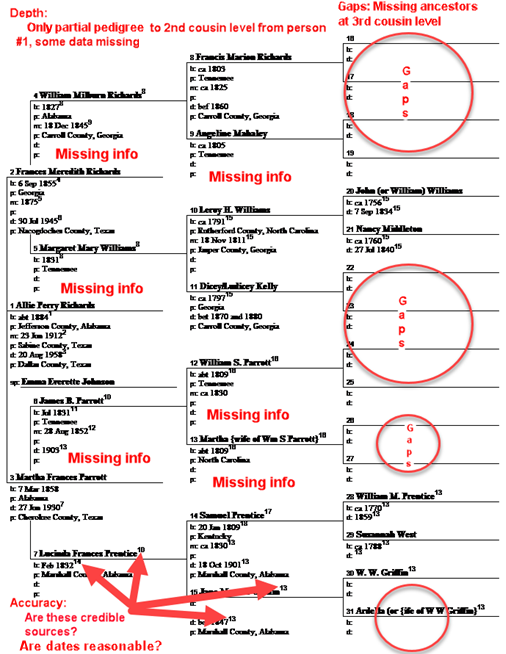 Depth of the pedigree: ideally, each DNA test taker’s pedigree chart should be complete back to the level of the hypothesized common ancestor, and preferably a few generations further back. If two DNA test takers are predicted to be third cousins, then both pedigrees should be complete at least back to the second-great-grandparents (the hypothesized common ancestral level). An extra generation or three in each tree helps if the test takers inherited more than the statistical average amount of DNA; in that case they may actually be fourth or fifth cousins instead of the predicted third cousins. See “Depth” at the top left of the image. In this example, all names are complete up to the great-grandparent level that would be shared with second cousins. However, all of the missing information on the birth, marriage, and death of many of these ancestors indicates this tree is not deep enough or verifiably accurate enough even at this level. Gaps in the pedigree: ideally, each pedigree will be complete with no gaps. In the real world many researchers have brick walls on some lines or just have not had time to research every possible line yet. Add to that the fact that every time a new ancestor is identified the next step is to identify that ancestor’s parents making genealogy truly a never-ending search. Board for Certification of Genealogists, "Ethics and Standards," scroll down to "Genealogical Proof Standard (GPS)" (https://bcgcertification.org/ethics/ethics-standards/). Board for Certification of Genealogists, Genealogy Standards, 50th anniversary ed. (Nashville, Tennessee: Turner Publ., 2014; https://bcgcertification.org/product/bcg-genealogy-standards/). Genetic Genealogy Standards Committee, Genetic Genealogy Standards, http://geneticgenealogystandards.com/. I have held Certified Genealogist® credentials from BCG since September 2010. I helped form the BCG Genetic Genealogy Committee to discuss DNA standards. I resigned from the committee due to personal commitments, but have continued to participate as an adviser, reviewer, and in other ways. I support the adoption of standards to be used when incorporating DNA analysis into a genealogical conclusion. I support BCG seeking input on the proposed standards from the greater genealogical community using DNA. I see this as a positive step to ensure newly adopted standards will meet the needs of the entire research community. No matter what is adopted, updates will certainly be needed just as research methodology and documentary research standards have evolved over the decades. 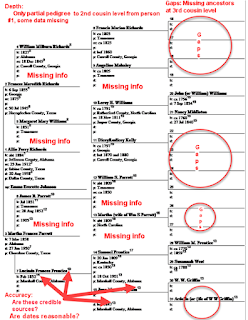 Debbie Parker Wayne, "DNA Standards - Pedigree Analysis (Tree Analysis)," Deb's Delvings, 23 May 2018 (http://debsdelvings.blogspot.com/ : accessed [date]). 20 June 2018: Updated link to DNA standards survey page. Those original standards primarily deal with ethical issues. The plan was to eventually add technical standards with more details on depth of testing, resolution of tests, and many other critical elements of using DNA test results to answer genealogical questions. As with so many other things, life got in the way and the additional work was never completed. In the intervening years, we have learned a lot more about using DNA test results effectively and how varied and "random" the results can be from one family to another. Real life results do not always match the statistical average predictions. By definition, an "average" is the typical result in a data set, but that means there are real results on either side of that average. This leads to many questions. How many men need to be tested in a Y-DNA line to prove or disprove a theory? How many markers should be tested? How many markers can differ? How big should an X-DNA segment be before you spend time searching for the common ancestor who passed it down to the people living today? There is no definitive answer to these questions. Many variables will affect the answer for a specific family under investigation although there are some general guidelines to consider. Many of us think we need defined standards for using DNA evidence to reach a genealogical conclusion even though there is no "magic number" answer to many questions. What should a thorough researcher do when incorporating DNA evidence into a genealogical conclusion? What do you look for other than the name of the same ancestor when analyzing another person's family tree? How do you document the analysis? 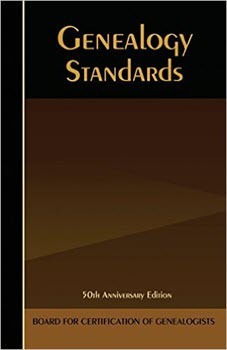 The Board for Certification of Genealogists (BCG) published The BCG Genealogical Standards Manual in 2000.7 This was reorganized, updated, and published as Genealogy Standards in 2014.8 These standards reflect best practices for the genealogical research community, not just those applying for BCG credentials. Some genealogists think these standards are all we need—that we do not need more specifics for DNA. My colleague, Harold Henderson, CG, makes an excellent point as to why DNA standards should also be spelled out (paraphrased and used with permission): A highly competent genealogist would be able to formulate standards based only on the elements of the Genealogical Proof Standard (GPS).9 By expanding the concepts of the GPS into the Genealogy Standards, BCG saved time for us all. Each researcher can understand the fine points of performing quality documentary research without having to recreate the standards. Defined DNA Standards provide the same service for those seeking to incorporate DNA analysis. 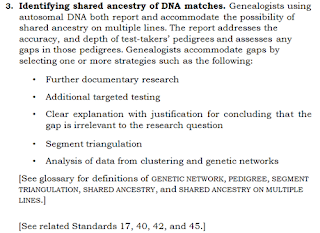 The BCG Genetic Genealogy Committee has drafted a set of DNA Standards that reflect the practices of some of the most experienced genealogists using DNA today. BCG is surveying the community for input on these proposed standards. Some current Genealogy Standards are modified and expanded to more clearly define the needs when using DNA. New DNA Standards address DNA testing, interpreting DNA test results, identifying shared ancestry, accessing test results, and integrating DNA and documentary evidence. These standards are focused to provide specific guidance yet broad enough to allow for differing family composition and random factors encountered with DNA. You can participate in the survey and provide your opinion through a Google Docs survey linked from https://bcgcertification.org/proposed-dna-standards-for-public-comment/. Please leave comments by 23 July 2018 explaining your agreement or disagreement with the proposed standards. Comments will be used to modify the standards as needed before acceptance and publication. There is also a link from which you can download a PDF file with the proposed standards. Feel free to leave comments here, but only comments submitted through the official portal above will be considered by the committee. 1. Genetic Genealogy Standards Committee, Genetic Genealogy Standards, http://geneticgenealogystandards.com/. 2. Donald Lines Jacobus, Genealogy as Pastime and Profession (1930, revised 1968; reprint, Baltimore, Maryland: Genealogical Publishing, 1999). 3. Genealogical Research: Methods and Sources, 2 vols. (Vienna, Virginia: American Society of Genealogists, 1980-1983). 4. Noel C. Stevenson, Genealogical Evidence: A Guide to the Standard of Proof Relating to Pedigrees, Ancestry, Heirship and Family History (Laguna Hills, California: Aegean Park Press, 1979). 5. Brenda Dougall Merriman, Genealogical Standards of Evidence (Toronto: Ontario Genealogical Society, 2010). 6. Robert Charles Anderson, Elements of Genealogical Analysis: How to Maximize Your Research Using the Great Migration Study Project Method (Boston: New England Historic Genealogical Society, 2014). 7. BCG Genealogical Standards Manual (Washington, DC: Board for Certification of Genealogists, 2000). 8. Board for Certification of Genealogists, Genealogy Standards, 50th anniversary ed. (Nashville, Tennessee: Turner Publ., 2014; https://bcgcertification.org/product/bcg-genealogy-standards/). 9. Board for Certification of Genealogists, "Ethics and Standards," scroll down to "Genealogical Proof Standard (GPS)" (https://bcgcertification.org/ethics/ethics-standards/). I have held Certified Genealogist® credentials from BCG since September 2010. I helped form the BCG Genetic Genealogy Committee to discuss DNA standards. I resigned from the committee due to personal commitments, but have continued to participate as an adviser, reviewer, and in other ways. I support the adoption of standards to be used when incorporating DNA analysis into a genealogical conclusion. I support BCG seeking input on the proposed standards from the greater genealogical community using DNA. I see this as a positive step to ensure newly adopted standards will meet the needs of the entire research community. No matter what is adopted, updates will certainly be needed just as research methodology and documentary research standards have evolved over the decades. 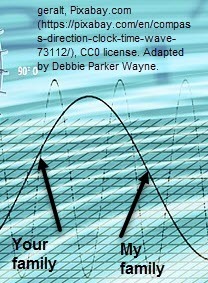 Debbie Parker Wayne, "DNA Analysis Standards," Deb's Delvings, 23 May 2018 (http://debsdelvings.blogspot.com/ : accessed [date]). 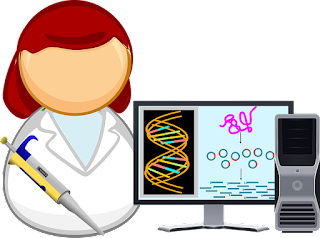 I am investigating bioinformatics1 tools to analyze Whole Genome Sequence (WGS) data. I have access to a WGS for someone who has also tested at several genealogy testing companies. I want to do some comparisons between the raw data from the genealogy testing companies and the WGS, checking for accuracy of the reads. To satisfy my curiosity, I plan to investigate some of the medical implications and traits discussed in scientific papers. 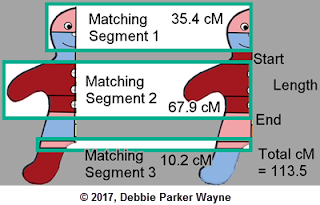 Once I have multiple WGSs from relatives, I plan to do some comparisons as to whether segments that the testing companies indicate match really do match completely with the higher resolution data. I am interested in how closely the statistical predictions on linkage disequilibrium and crossovers mirror what is seen in real family multi-generational studies. For example, in the shared segments marked below, not every SNP is tested. 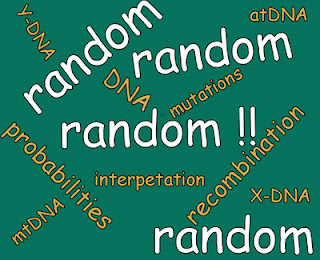 A number of SNPs in a segment are tested and we assume the non-tested SNPs match based on statistical predictions. My previous career in software development, testing, and support made me familiar with Open-Source Software so I look for available tools before spending time writing my own. Tools I am checking out include Samtools, National Center for Biotechnology Information's (NCBI) Genome Workbench, and Broad Institute's Integrative Genome Viewer (IGV). "A large-scale analysis of bioinformatics code on GitHub," by Pamela H Russell, Rachel L Johnson, Shreyas Ananthan, Benjamin Harnke, and Nichole E Carlson, doi: https://doi.org/10.1101/321919. The meaty data is in the supplemental material which consists of several large files (some over 200MB) linked from the article abstract. By the way, just as with some of the best genealogy articles, the reference notes in this article led me to several additional sources I now need to consult. As a woman, this sentence is especially depressing: "... the proportion of female contributors decreases for high-profile repositories and with seniority level in author lists".2 I hope this changes and more women participate in bioinformatics. geralt, Pixabay (https://pixabay.com/en/learn-mathematics-child-girl-2405206/ : accessed 15 May 2018), CC0 Creative Commons. I am impressed with how many databases and tools are out there for DNA analysis. I did not realize there are over 1,700 bioinformatics repositories and "23 'high profile' GitHub repositories containing source code for popular and highly respected bioinformatic tools. "3 "Our analysis points to simple recommendations for selecting bioinformatic tools from among the thousands available. "4 Some of these will not be useful for genealogy, but some will. One tool aimed at the genetic genealogy community is Thomas Krahn's tool for annotating a BigY VCF file and identifying derived and novel SNPs.5 Thomas kindly shared this tool so others can do the analysis instead of having it done by his company YSEQ.net. Some of the discussions in the scientific world parallel those we are having in the genealogy world. "In recent years, the explosion of genomic data and bioinformatic tools has been accompanied by a growing conversation around reproducibility of results and usability of software. Reproducibility requires that authors publish original data and a clear protocol to allow repetition of the analysis in a paper. "6 In the genealogy world we are discussing publicly available DNA data, such as on GEDmatch.com, allowing DNA analysis to be reproduced and referenced from a publication. OpenClipart-Vectors, Pixabay (https://pixabay.com/en/analysis-biology-biotechnology-2025786/ : accessed 15 May 2018), CC0 Creative Commons. "The bioinformatics field embraces a culture of sharing — for both data and source code — that supports rapid scientific and technical progress. "7 In the genealogy world we are discussing privacy issues versus sharing data, especially with the recent proliferation of stories on law enforcement use of genealogy databases. In addition to DNA adding to my knowledge of my family tree, it is forcing me to upgrade my data analysis knowledge and computer tools familiarity. I hope all of this study helps keep my mind active and reduces those "senior moments" that seem to occur more frequently with the years. 1. The science of collecting and analyzing complex biological data such as genetic code. 2. Pamela H Russell, et al., "A large-scale analysis of bioinformatics code on GitHub," 15 May 2018, BioRxiv pre-publication, https://doi.org/10.1101/321919, line 35. 5. Thomas Krahn, "bigY_hg39_pipeline.sh," GitHubGist (https://gist.github.com/tkrahn/283462028c61cd213399ba7f6b773893). 6. Russell, "A large-scale analysis of bioinformatics code on GitHub," line 84. Debbie Parker Wayne, "Whole Genome Sequence (Part 2) - Analysis Tools," Deb's Delvings, 15 May 2018 (http://debsdelvings.blogspot.com/ : accessed [date]).